Successfully Added Deluxe Stereo Earphones for IPHONE, IPOD, MP3 and MP4 Players to your Shopping Cart. Deluxe quality in ear headphones for iPhone, iPod, MP3 and MP4 players, and other portable AV devices that use a 3.5mm audio jack. We are pleased to present to you these high quality, lightweight earphones in a white and brushed silver finish with an extra long 122cm cable (48 inches). These comfortable earphones are designed to provide high response digital music playback while also including an on cord controller with ON/OFF/MIC functions when using them as a headset for an iPhone or computer. Better still, the on-cord MIC has a windscreen design for maximum clarity when talking while on the go. 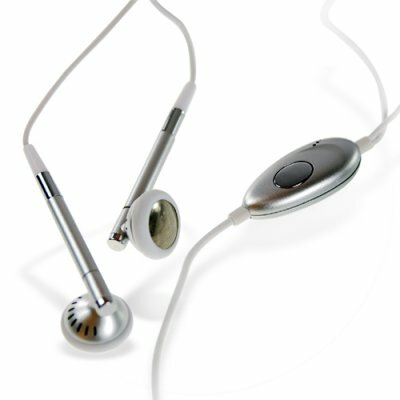 These headphones are suitable for iLife products, portable music players, as well as for computers. With superior styling and ergonomically designed for hours of use, the in-ear headphones deliver brilliant results and fit snugly to provide outstanding comfort for maximum music enjoyment. We are offering this item at a quantity of at least 10 pieces in order to give you the absolute best re-sale profit margin from our low wholesale price and even better shipping rates. Brought to you from the leader in wholesale direct from China electronics, Chinavasion. Recommended for PC multimedia, digital music players, and portable gaming systems with a 3.5mm audio jack. Extremely small and lightweight, these in-ear head phones use a silver-plated 3.5mm jack offering high quality sound reproduction for an enhanced audio experience.